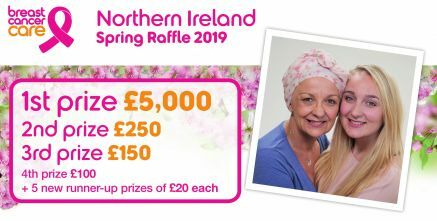 Our raffles raise money for Breast Cancer Care’s services and help spread the word about how we support people affected by breast cancer across Northern Ireland and Great Britain. We want to ensure so that no-one has to face breast cancer alone. One per cent of our funding is from government, so we simply couldn’t provide our services without the kind support of the public. The responsible person for our raffle is: Catherine McCrohan, Breast Cancer Care, Kennington Business Park, Chester House, 1-3 Brixton Road, London, SW9 6DE. The registered society is Breast Cancer Care. Breast Cancer Care’s Northern Ireland Raffle is registered with Belfast City Council, registration number 238. For more raffle tickets (up to a maximum of 60 per person) or requests to be removed from future raffle mailings please phone us on 0345 092 0811 – thank you so much for your very kind support. To ensure you don’t receive any future raffle mailings, please email reply@breastcancercare.org.uk, or phone us on 0345 092 0811 and we’ll be very pleased to respect your request. The Breast Cancer Care Northern Ireland Raffle is open to all residents of Northern Ireland over the age of 18. Winners will be notified in writing within two weeks of the draw. The draw for the Northern Ireland Christmas Raffle will be held on 29 March 2019. Winners will be listed on our website within two weeks of the draw, in our Northern Ireland raffle section. No ticket can be sold to, bought on behalf of, or bought by anyone under the age of 18. Prize winners may be age verified after the draw: any person found to be under the age of 18 automatically forfeits the right to any prize. No ticket may be sold to or by anyone in the street. Entries received after the closing date will be treated as donations. Our raffle administration is managed by a licensed external lottery manager, specialised in the professional operation of charity lotteries (also known as society lotteries). All proceeds from this raffle will be used for the charitable purposes of Breast Cancer Care which are to support people affected by breast cancer across Northern Ireland and GB. Donations may be used to reduce costs. The winner's photograph may be requested for future publications. Entries must not be bought on behalf of another person. To learn more about our policies relating to responsible gambling, underage gambling, fair and open draws and our complaints procedure, please see our policies. We occasionally distribute unaddressed mail to households in certain areas (door drop). For information about how we approach this activity, please read our policies for unaddressed mail. For more information about Breast Cancer Care, our raffles and other ways to donate, please browse www.breastcancercare.org.uk or contact our dedicated supporter care team on 0345 092 0817. If you’re worried you may be gambling more than you really want to, the website at www.begambleaware.org or helpline on 0808 8020 133 (lines open 8am to midnight, seven days a week) can provide you with free help and advice. Gamble Aware is the leading provider of information, advice, support and free counseling for the prevention and treatment of problem gambling. And if you wish us to avoid sending you opportunities to participate in our raffle, or to limit the number of occasions on which we do this, or to limit the number of books we send you, please call us weekdays on 0345 092 0811 from 9am to 5pm or email raffle@breastcancercare.org.uk and we’ll be pleased to respect this.